Solispost is fast becoming one of the more popular products offered by ID Signsystems. 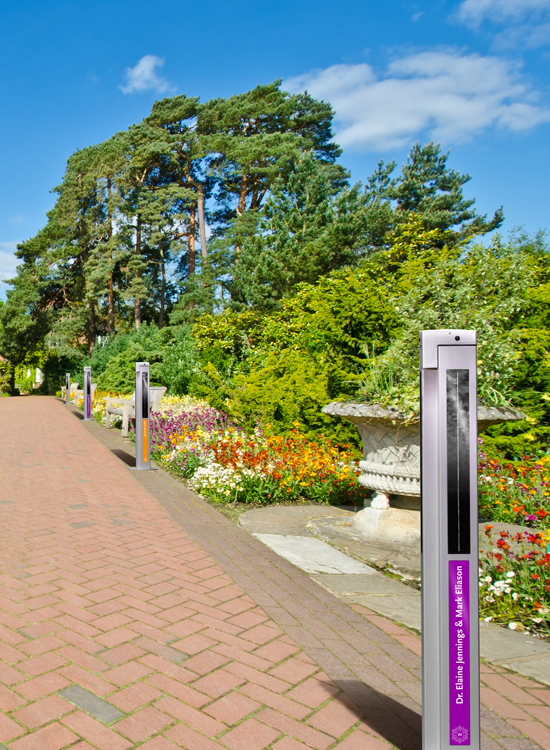 These free-standing, lighted bollards are a completely solar-powered, Eco-friendly and energy-efficient solution to lighting and security needs. Studies have illustrated the safety benefits of installing lighted bollards along walkways or paths where pedestrians could be exposed to crime. The bollards react to surrounding activity, transitioning from low lighting to full brightness whenever a passerby approaches. This clever technology serves two purposes: management of energy use, thereby controlling utility cost; and providing a sense of security by projecting a shroud of light that envelops pedestrians and bicyclists. You most likely see a need and recognize the value a Solispost installation can add to your facility, but you must deal with budget limitations. This is an often-typical obstacle for non-profits or publicly-owned organizations. With our newly-launched Solispost Sponsorship Program, a portion or all of the costs of purchase and installation may be covered by sponsors who wish to support your organization. In exchange for their contributions, we design and affix (on each Solispost they purchase) a custom branding panel incorporating their names or logo. We can also custom engrave the Solispost cap with a sponsor’s name or logo for a more stately tribute. In that Solispost is recognized as a responsible (light pollution is limited due to the sensors), ecological, (completely solar-powered) unobtrusive and cost effective (no trenching or wiring required during installation) solution, there is great appeal for sponsors to be affiliated and play an active role in the growing ‘solar revolution’. As it is important to recognize various levels of sponsorship, we will manage the creation of a donor hierarchy through sizing, visibility and technique. Our team will also work with you on placement and all installation details for your facility and ensure that everything is properly coordinated. Read more about our Donor Recognition Planning and Development Services. This program provides a great opportunity for a win-win outcome. You expedite the acquisition of Solispost for your facility grounds and reap the safety and security benefits, while your sponsors are recognized for their support of solar energy through purchase of this brilliant, state-of-the-art product. We’re With You Every Step of the Way – Let’s Get Started! Let's discuss YOUR Solispost Sponsorship Program!